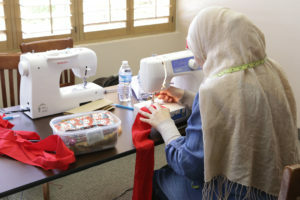 Sewing for Success is a 6-8 week long class that teaches women the basics of sewing through simple projects. Once they master the skills, they produce items that are sold at our events, online, booths at other events and by word of mouth. Proceeds from the sales go directly to the women who made the item. 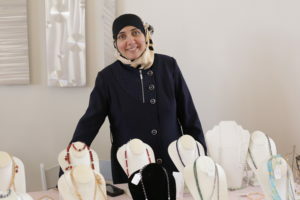 This program teaches women the art of beaded jewelry making, We hold workshops, led by professional jewelry artists, that teach women the basics of jewelry making, how to purchase materials and price their items to sell. AMWA advertises and markets their products, provides venues for selling and eventually helps them set up their own home based business. 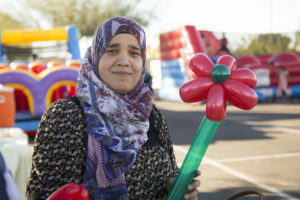 Participants are taught how to create balloon animals, flowers and other creations by a trained balloon artist. They are also taught designs for face painting. AMWA promotes their services as entertainers at family-friendly events such as kids birthday parties, Eid parties, graduations, weddings, masjid events, etc.